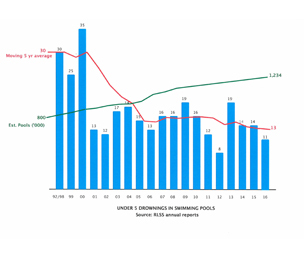 The National Drowning Report 2016 prepared by Royal Life Saving Australia has shown that while total pool drownings increased, the all-important under-fives category has shown a considerable decrease. Over the period from 1 July 2015 and 30 June 2016 there was a decrease of 31 per cent of pool drownings for under-fives, compared to the 10-year average. The 11 drownings were 36 per cent less than the 14 that occurred over the same period last year. While each death is a tragedy, the fact that less under-fives are drowning in swimming pools is a positive development. The drowning rate for under-fives is also of most importance for the industry as swimming pools account for more than half the deaths in that group, and it is the basis for the swimming pool fencing regulations across various jurisdictions. Therefore, a decrease in pool drownings in the under-fives indicates the industry and regulatory safety measures are finding some success. Cal Stanley, who has sat on a number of Standards committees relating to pool safety, says the improvement is even greater when weighed against the increase in pool numbers. 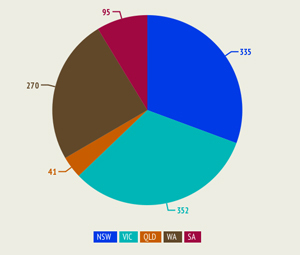 He points out that other statistics from the 2016 Drowning Report – and other similar studies – indicate very low levels of drownings when the pool barrier is compliant, with the vast majority occurring in pools with defective barriers or (particularly in NSW) those with no barrier at all. Private swimming pool drowning deaths in children under five in New South Wales were reviewed in the report. 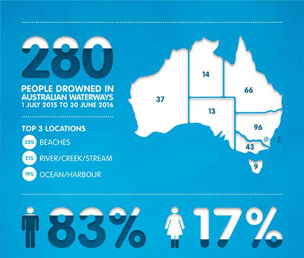 Between 1 July 2002 and 30 June 2015, 83 such drowning deaths were recorded. The key findings related to appropriate supervision, pool fencing and emergency care. • Among cases with available information, children most commonly gained access to the pool through a faulty fence or gate (38 per cent), lack of a fence (31 per cent) or a gate which was propped open (18 per cent). The Australian Swim Schools Association (ASSA) CEO Ross Gage urged all Australians to learn swimming and water safety skills in the wake of the report. Of particular concern to ASSA is the 21 fatalities in the under-five age group. “For every death, many are left with some form of permanent brain damage from immersions,” he says. “The report highlights that once again swimming pools are by far and away the main location for such terrible accidents. He recommends parents seek out an ASSA member swim school, but also says that while swimming and water safety lessons are vital layers of protection, they are not a substitute for proper supervision and barriers. 1. Constant adult supervision: Don’t let the kids out of your sight. 2. Proper barriers in place: Keep fences and gates locked up tight. 3. Swimming and water safety skills and education: Learn to Swim, and how to get to safety. 4. Emergency Action Plan: Always have a plan in case of emergency. ASSA encourages parents to enrol children in swimming lessons in their early months, allowing time for the infant’s immune system to strengthen and bonds to develop with their primary carers. 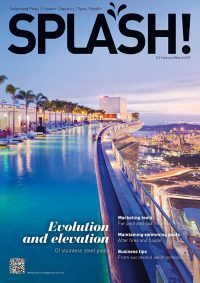 There will be more information on this topic in the October issue of SPLASH! (edition 108).